It's always nice to get a tax break for something you have little or no choice about paying. Carrying health insurance is mandatory under the terms of the Affordable Care Act, at least if you don't want to pay a tax penalty in the 2018 tax year. The Tax Cuts and Jobs Act (TCJA) repeals the penalty beginning in 2019. The 2018 penalty isn't tax deductible, but some taxpayers can deduct the cost of the health insurance premiums they pay. Eligibility depends on whether you’re an employee or self-employed, and whether you paid for your insurance using pre-tax dollars or post-tax dollars. It can also depend on whether you take the standard deduction or itemize. Health insurance costs are included among expenses that are eligible for the medical expense deduction. You must itemize to take this deduction, and it’s limited to the amount of your overall costs that exceed 7.5 percent of your adjusted gross income (AGI) in 2018. This is another change brought about by the TCJA. The threshold used to be 10 percent, and it's slated to return to 10 percent in 2019. This rule is typically disadvantageous mathematically unless you have significant other medical expenses in addition to your insurance premiums. You can include these to help you get over the 7.5 percent threshold. You can only deduct total premiums that exceed 7.5 percent of your AGI in the 2018 tax year. If your AGI was $60,000 in 2018 and you paid $4,500 in health insurance premiums over the course of the tax year, you can’t deduct your premiums. You didn’t pay anything in excess of 7.5 percent of your AGI, which works out to $4,500. But if you also paid $3,000 in additional uninsured medical expenses, you’ve now spent a cumulative total of $7,500. This is $3,000 more than your 7.5 percent threshold. You can therefore claim that entire $3,000 as a tax deduction. The threshold was only 7.5 percent prior to 2013 when it increased to 10 percent. Even so, it remained at 7.5 percent for taxpayers who were age 65 or older, at least for a little while. Then, as of Dec. 31, 2016, all taxpayers were supposed to meet the 10 percent threshold to be able to claim this deduction regardless of age. The TCJA restored the threshold to 7.5 percent retroactively for 2017, and going forward through 2018, but this provision unfortunately expires on Jan. 1, 2019. You'll have to surpass 10 percent again when you prepare your 2019 return in 2020. The good news is that this percentage does not apply to your total income, but only to your AGI. This is the number that's arrived at after you've taken certain above-the-line deductions on the first page of your 2018 tax return, reducing your total income to your taxable income. Above-the-line deductions include things like alimony you paid—although this changes, too, in 2019 due to the TCJA. They also include certain retirement plan contributions, tuition, and student loan interest. Your AGI will typically be less than your overall income if you can claim any of these deductions. For example, maybe you earned $60,000, but you paid your ex $16,000 in alimony in 2018. Your AGI is therefore $44,000, not $60,000, and your 7.5 percent threshold drops from to $4,500 to $3,300. Your AGI appears on line 37 of the 2018 Form 1040 before you get around to claiming itemized deductions or the standard deduction for your filing status on the next page of the return. This line is expected to change in the 2019 filing season for 2018 returns, however. The IRS has revised the 1040 to accommodate some of the changes made by the TCJA. Employees who pay for health insurance with pre-tax dollars through payroll deductions aren’t eligible to take a further deduction for these same expenses. Check your pay stubs if you’re unsure how you’re paying for insurance that's available through your employer. You're using pre-tax dollars if the deductions for insurance are made before your employer calculates your tax withholding on the balance. This isn’t necessarily a bad thing. Paying for health insurance as a pre-tax salary deduction is actually more advantageous and will probably save you more money than taking the itemized deduction for medical expenses. 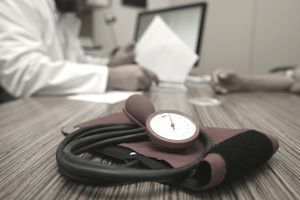 Pre-tax health benefits reduce your taxable salary, and the income tax, Social Security tax, and Medicare tax that you must pay are all a percentage of that taxable salary. So this employee benefit is effectively triple tax-free when your taxable salary is reduced by the amount of your health insurance premiums. It might even be quadruple tax-free if your state allows for pre-tax health insurance benefits at that tax level as well. Self-employed persons can take a deduction for health insurance premiums they pay for coverage for themselves and their dependents directly on Form 1040. This is another above-the-line adjustment to income. You can enter the total of what you paid on line 29 on the first page of your 2018 tax return. This is one of those deductions that can reduce your AGI from the total of your gross income, and you don't have to itemize your deductions to take it. It's not limited by the 7.5-percent-of-AGI rule—you can claim the entirety of what you spent on premiums, although you can’t add in any uninsured medical costs unless you also itemize—you would claim these on Schedule A along with all your other itemized deductions. Employees benefit when health insurance premiums are deducted tax-free from their salaries without any of the limitations associated with the itemized deduction. Self-employed persons can deduct health insurance "above the line" on the first page of their 2018 1040s, which also eliminates the hassle and limitations of itemizing. Other taxpayers can deduct the cost of health insurance as an itemized deduction only if their overall medical and dental expenses exceed 7.5 percent of their adjusted gross incomes in 2018. Tax laws change periodically, and you should consult with a tax professional for the most up-to-date advice. The information contained in this article is not intended as tax advice and is not a substitute for tax advice.